Grammy award-winning pianist Bill Charlap has performed with many of the leading artists of our time including Phil Woods, Tony Bennett, Gerry Mulligan, Wynton Marsalis, Freddy Cole and Houston Person. In 1997 Charlap formed his trio with bassist Peter Washington and drummer Kenny Washington, now recognized as one of the leading groups in jazz. In 2000, he was signed to Blue Note Records and received two Grammy Award nominations, for Somewhere: The Songs of Leonard Bernstein and The Bill Charlap Trio: Live at the Village Vanguard. He is known for his interpretations of American popular song. In 2016, Tony Bennett & Bill Charlap: The Silver Lining, The Songs of Jerome Kern, was awarded a Grammy for Best Traditional Pop Album. 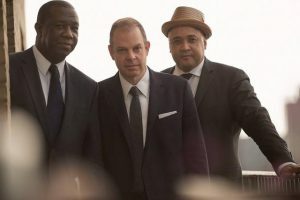 In April, the Bill Charlap Trio released, Notes from New York, their debut recording for the Impulse label.